At some point, Catholic horror experiences diminishing returns because inevitable comparisons will be made to William Friedkin's 1973 oeuvre. 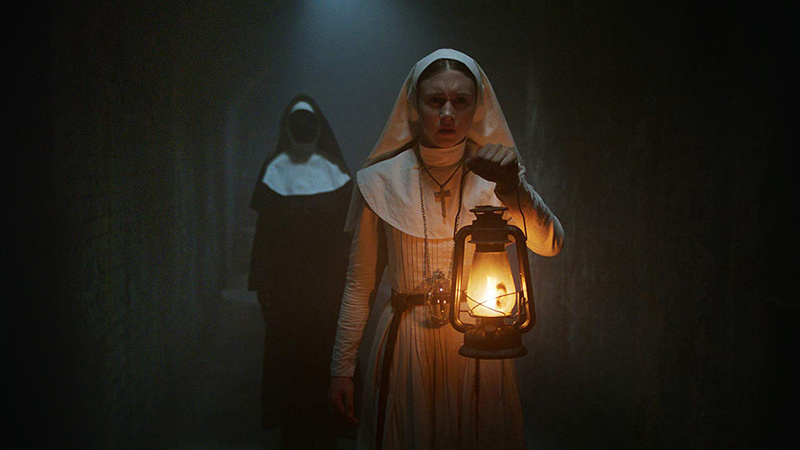 Which is why we had such big expectations for The Nun, the fifth film in The Conjuring Cinematic Universe, where fans of the franchise would get to see the twisted origins of Valak—the demon who terrified supernatural investigator Lorraine Warren and likes putting on the face of a monstrous nun to mock clergy and, hopefully, remind people of the dangers of going out in the sun sans moisturizer or sunscreen. Excellent trailers brought up hype and hope that this one would be kinda sorta The Exorcist chapter of The Conjuring Saga, where deep, religious, and moodily meditative scenes would abound about the nature of spiritual weakness and possession and questionings about Gods wisdom and motive in letting such evil exist in His vast Creation. It's a pity because with hellishly imaginative titles of Valak like the Defiler, the Profane, and the Marquis of Snakes, we thought this would be a chance to have invariably good scares on a purely supernatural vein sans the trapping of weird science with The Warrens. But, none of that. This is standard-issue derivative at worst and confusingly underwheling at best. To be fair though, there are plenty of heart-stopping moments, even at the start. 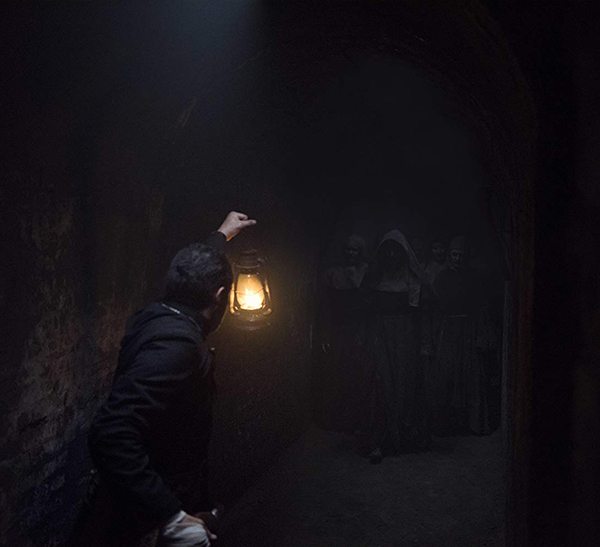 We open with two fearful nuns carrying an elaborate key, seeking a "relic" and trying to get past a door at the end of a dark, misty corridor. The old door has a sign that reads: "God Ends Here." Helpful and concise with their medieval post-its, these nuns are. As soon as they open said door, bad things happen and we'll let you find out about them on your own. A few days later, the French-Canadian delivery man Frenchie (Jonas Bloquet) is bringing in the usual supplies for the sisters from a nearby village when he discovers the body of a young nun hanging from the convent walls, in front of the façade, already being picked on by crows and ravens clutching same mysterious key. Later we learn that we are deep in the highlands of provincial Romania and that the place is the Abbey of St. Carta. The convent is attached to a sprawling castle that is also run by the silent nuns of the abbey. It's already 1952 but the bombs of WWII have still left the caste in a state of disrepair, full of holes in its parapets and battlements. 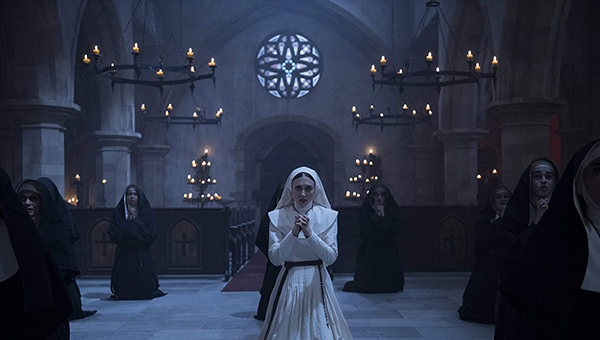 Meanwhile, the Vatican has received word of the nun's suicide and mysterious happenings at the abbey prompt them to send their "miracle hunter" Father Burke (Demian Bichir). 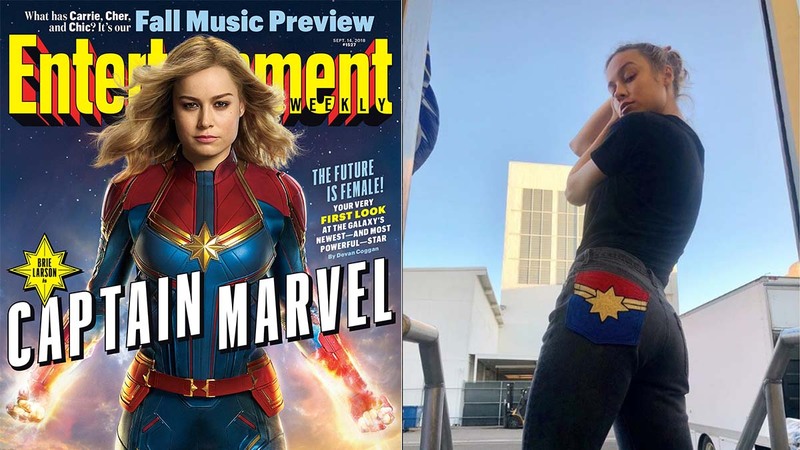 To assist him, they send the beautiful and young novice Sister Irene (Taissa Farmiga, sister to Vera Farmiga who plays the lead in The Conjuring) for reasons neither initially understand but they do have faith in the Vatican's head honchos and it turns out they're well-founded because they do gel well as a team later on. The two clerics journey to the closest Romanian village near the abbey, which is coincidentally where Frenchie lives, and he agrees to guide them to the castle where the borders are heavily decorated with crosses and graves. When they encounter the mother superior (or abbess), she asks the two Vatican agents to stay the night because the sisters have a vow of silence from sundown to sunup. Sister Irene and Father Burke stay, Frenchie goes, and things quickly go sideways. We did greatly enjoy the cinematography, the truly gorgeous invocation of the '70s horror aesthetic, and the plenty of gulpi de gulat fun. 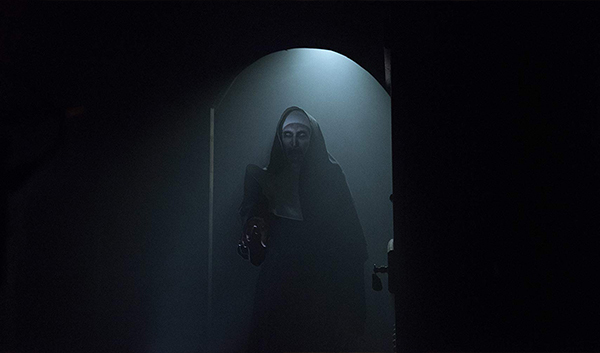 Especially since The Nun's visual and auditory (the music and sound design whenever Valak comes on-screen are superb) presentation dredges up all of the spooky suspicions of anybody who went to Catholic school. 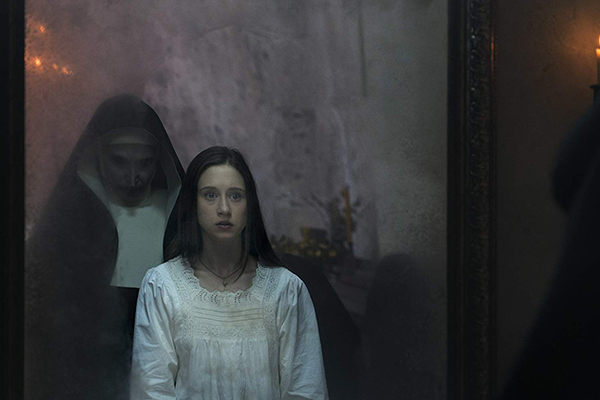 The atmosphere of 1950s Romania with the superstition and the deep foggy forests that surround the castle create an aptly creepy mood with the dream invasions and waking hallucinations of Valak. There's also much joy in the performance of Taissa Farmiga (will they eventually connect her character to Lorraine Warren?) as the naïve but faithful Sister Irene, who seems to have the most agency in this story, aside from the gun-toting Frenchie (why his gun would even work escapes us). Bichir's supposed exorcist extraordinaire Father Burke is reduced to opening doors, cowering behind crosses, and reading books for the audience's benefit with no actual clout to move the story forward. But it's Bonnie Aarons as Valak, floating and stalking the castle corridors, who should really get the prime accolade of this mediocre terror effort if it did have laurels to give. At past the halfway point, it becomes clear that director Corin Hardy isn't as practiced with the misleading beats as James Wan is, and you can tell by the lead up when the true scares are going to go "Boo!" There's very little sense to what's going on and there are zero rules of demonology drawn, or even outlined for premise, for abjuring or defeating Valak. Add to the fact that we already know this Prince of Hell will eventually escape to bother The Warrens in the 1970s and we were left scratching our head at the why of it all. Is this whole movie simply a series of scary scenes strung together as a placeholder for the next real installment in the franchise? If it is, then at this point, the whole catastrophe after Conjuring 2 really seems better off being shut down and calling it quits. Before things get worse (and they always can: hello, Resident Evil). Any horror fan can foresee these events from the get go, right when they finish the introductions and roll out an idyllic drone shot of the sprawling castle that doubles as a nunnery. You just know in your terror-craving heart the characters will need to explore those deep dark bowels and horrible things will happen before they can confront the vile creature. It also, much to our chagrin, becomes a kind of horror-adventure meets dungeon-clearing movie towards the end, where the misfit Vatican agents and one hapless poultry farmer try to keep the marauding, extra-dimensional evil from escaping the labyrinthine and elaborate trap from which it was boxed in. Yes, it's as absurd as it sounds. And not even all the nasty tricks and frisson treats of the old Hammer Horror playbook can save this one from being dismally average.